Horror movies are slowly making their way back in the big screens now we're only a couple of months from October. That can either be a good thing or a bad thing — it all depends if the movie is good enough to scare you or boring enough to swear off horror movies forever. Sinister brings its sequel to the light (or dark in this case) to kick off the season. If you remember the first, it is about an evil that somehow takes control or manipulates a child from a family and that said child films himself killing his family in the situation he's in and in return the bagul or "boogeyman" takes his soul and moves on to his next victims. In Sinister 2, the deputy who was helping the family in the first returns to prevent the same tragedy from happening to another family. He (James Ransone) meets with a mother by the name of Courtney Collins (Shannyn Sossamon) and her two boys Dylan (Robert Daniel Sloan) and Zach (Dartanian Sloan). The way he meets them is by shock — he was going to burn down the house they were staying at for reasons you need to see for yourself. Instead, the deputy helps out the family who the bagul has set his eyes on next. 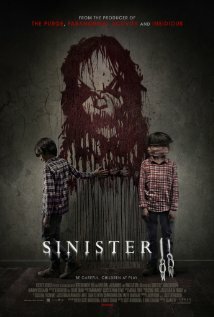 Sinister 2 was a good change of pace from summer action flicks. I'm not saying this is the scariest movie I've ever seen but it had some good scenes where I jumped a few times. The story was a good follow up for the first but go in with low expectations. You will see more of the origin of the story of bagul and the souls he takes because without those souls he would have a harder time convincing his next victim to do the same dreadful things to their family.